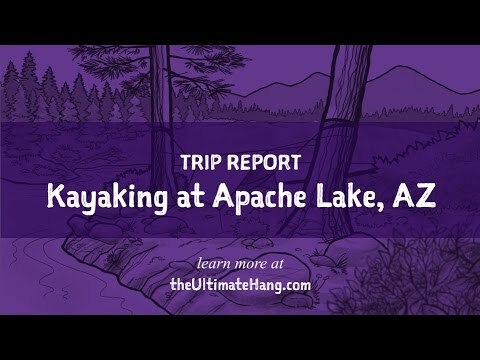 I was invited to do a quick overnight kayaking trip on Apache Lake in Arizona in January. Coined a “cold weather” event for those coming up from Phoenix, for me, it would be a rather warm destination as I was traveling south from Flagstaff. Apache Lake is a man-made reservoir created in 1927 to help control the flow of the Salt River. 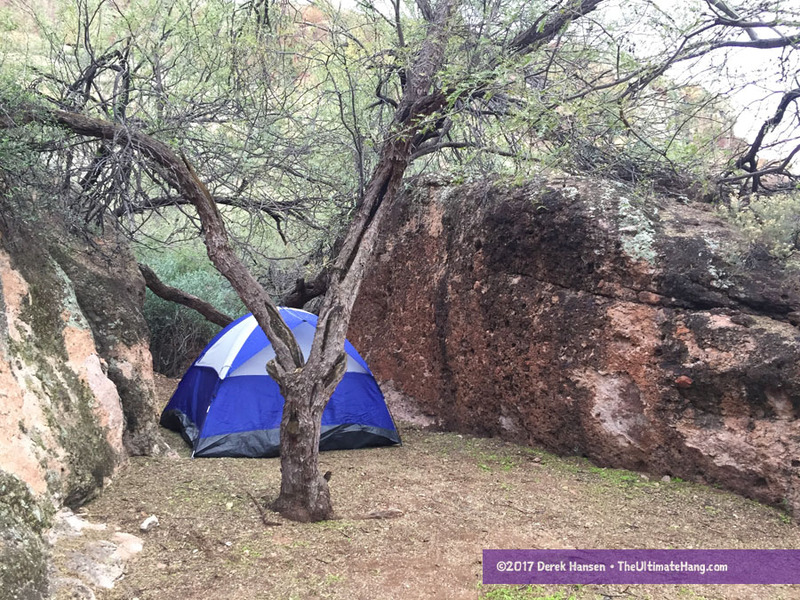 It is located in the Tonto National Forest, about 65 miles north of Phoenix and 184 miles south of Flagstaff. 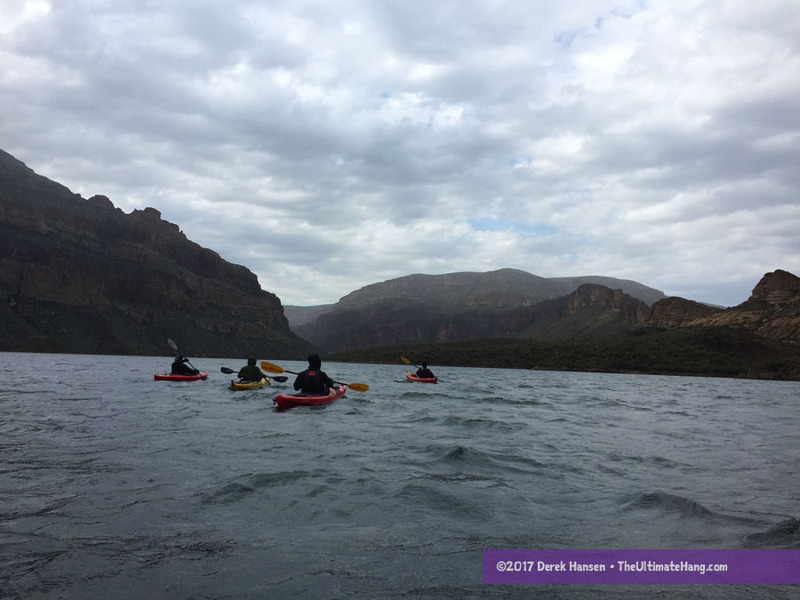 I’d never been to Apache Lake, and I’d never been kayaking before. The real draw for me was paddling out to a remote location and hammock camping with some fellow enthusiasts. As this was my first trip to the Tonto Basin, I stopped along the way in Strawberry and Pine and then proceeded to Payson where I picked up a Tonto Day Pass at the ranger station before driving to Roosevelt Dam. Moving south, the road suddenly changed from a two-way paved road to a graded, single-lane dirt road that roughly followed the contours of Apache Lake. The twelve-mile stretch to the marina was at times wide and smooth and other times I clenched my steering wheel as I navigated narrow, blind corners with steep fall off. Making it to the marina beach at dusk was met with a sigh of relief, but I waited about 40 minutes before the main group arrived. By then, the sun had set. 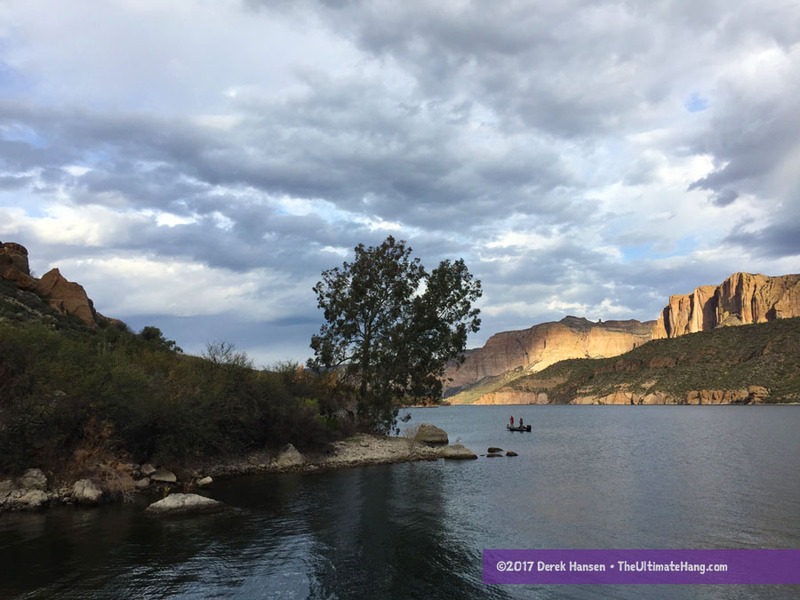 It was pitch black with only a few lights from the marina providing a silhouette of the ridgeline of the sandstone cliffs across the lake. While I waited, a red fox shuffled past my car. It was a surprising spectacle and I enjoyed the front-row view as he scurried away into the blackness. When the paddle group arrived, preparations began in earnest. We unpacked the kayaks, loaded gear, made assignments, and prepared to embark. I’ve done a fair share of canoeing, but this would be my first attempt at kayaking. After loading my gear (everything double packed in waterproof stuff sacks), I glided out into the still and smooth blackness. Each of us had a glowing light clipped to the stern of the kayak, which was about the only indicator of where each other was paddling as we mostly moved silently across the water. It was a surreal experience that I’ll long remember. The only sounds came from the rhythmic dip of the paddle blades as they cut into the water. I picked up the paddling pretty quickly, but found I was bringing a fair amount of water into my cockpit. A tip from a nearby paddler informed me that my drip rings were too close to hands and boat. After a quick adjustment I was less concerned about swamping my boat. 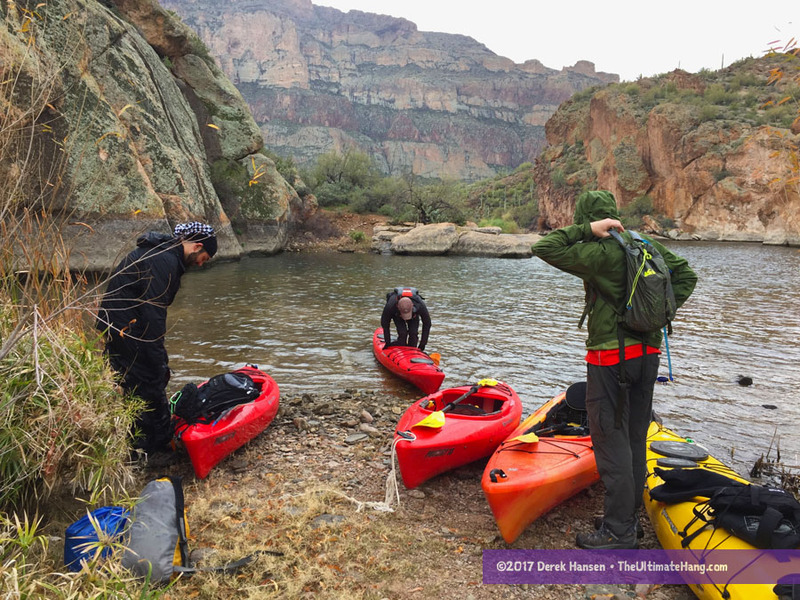 We paddled for about 35 minutes or so to a rocky beach the crew affectionately called the “Shire.” The place was amazing — the ground was covered in soft, spongy duff and filled with twisting maple, mesquite, and palo verde trees. The tree canopy nearly covered the site, giving it an enclosed, almost Hobbit-hole-like aura. 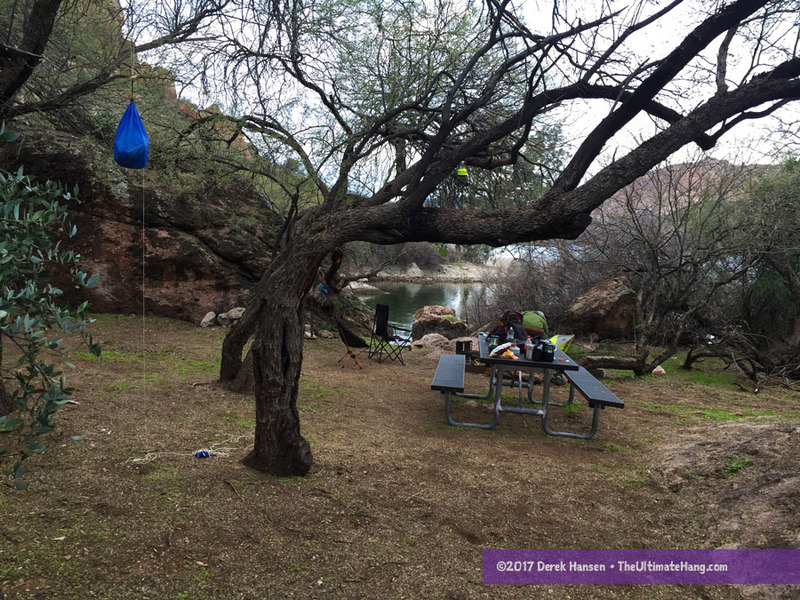 Large rock boulders divided the spot providing a secluded camping area and dining area, complete with a grill and table. After a tour of the site, we picked our spots for hammocks and a few tents. For this trip, I was testing the Dutchware Chameleon hammock and the Warbonnet Wookie under quilt. Although I knew I was heading to warmer country, I brought way too much insulation than I needed. Better safe than sorry? The site became a little more cramped once we all set up our hammocks and tarps, but everyone seemed very congenial and we spent the evening swapping stories and enjoying each others company. We stayed up past midnight as we waited for the last few members of the group to arrive. I slept wonderfully warm and comfortable in the Chameleon hammock and was wakened only briefly when the rain finally began. I was well-protected under the large Winter Dream tarp from Underground Quilts. At times I was almost too warm and I kept my top quilt open to vent. I think the low was in the mid 40’s°F. We all enjoyed a lazy start to the morning, followed by eating breakfast and exploring. We had expected some rain over the weekend and during the night we had a few showers, but nothing major. The main storms were suppose to arrive Saturday afternoon. The plan was the spend the rest of the day kayaking the lake and exploring a few secluded spots. We set off paddling at around 10:30 a.m. and within an hour we found ourselves in our first cloud burst. It was a fun downpour and we were generally cheering to each other at how much fun this was going to be. After exploring a hermit cave, we went further south and stopped at an alcove and did a little canyoneering. The day was just perfect (up to that point) with amazing cloud cover with sunlight breaking through painting bright colors across a rocky canvas. We enjoyed lunch among the cliffs and canyons and trees still holding on to their fall colors. We carefully negotiated our way across the rocks back down to our kayaks, but on the last jump off the rocks, I popped my ankle and twisted it badly. The pain was acute and I worried I broke something. Trying hard not to cry like an infant in front of my new friends, I carefully felt my ankle and began moving it gingerly feeling for the sharp pain or protrusion that would indicate a break. Thankfully (but still painfully) I determined it was just a nasty sprain. I limped my way back to the kayaks and began to load up for the trip back to camp. We had the wind at our backs on the way to the rock grotto, so when returning, we had a nice stiff breeze pushing against us. Within a few moments, the real storm unleashed its fury and I found myself scrambling for my rain jacket as temperatures dropped and the rain descended. The wind picked up and so did the waves, which began to roll and crash with white caps against the bow of my 10-foot kayak. Every stroke became a burden, but I knew that if I stopped, I would be pushed backwards. Progress was very slow and painful. At times I had to stop to slosh water off the bib covering my cockpit. Water still found its way through its seal and in time my pants were soaked. I struggled to keep my kayak pointed at major landmarks I hoped was our destination, only to find it was a landmark beyond. We pushed through wave after wave of rain that seemed relentless. At last, we reached the rocky beach and were welcomed with clear skies and a glass-like lake. My arms were paddling robotically by this point, but the perfect conditions were a welcome respite. We all quickly packed our bags and cleaned up camp. It was nearing the end of the day, and the end of our permit. The final paddle back to the marina was calm and beautiful but we agreed that this trip was a brutal start for my kayaking career. Nice report, sounds like a fun trip. Sorry about the ankle, hope it feels better. I been looking at a warbonnet wookie for my XLC. Would you recommend it over a Hammock gear incubator or similar underquilt? I like its 2 connection points and that’s it. The Wookie is a good match for the Warbonet. I’d do it. Ok I’m getting one. Thanks. Derek, it sounds amazing. I’m embarking on a first time ever kayaking/hammock camping trip in Whiteshell Park (Manitoba, Canada) this summer. A friend and I are kayaking to one of the islands and setting up camp for a few days. Apart from the ankle issue, I hope my trip is just as awesome. I’m sure it will be epoch! Not a trip for the beginners then! Also, I’ve really gotta try the whole hammock thing. Apache Lake is great for beginners. The storm wasn’t nice, but that’s our own fault. You should definitely try hammocks! I’m inspired by your trip! I’d like to take my daughter on an overnight canoe trip. The site you stayed at looks amazing. Are you willing to share directions?